Put the mussels to boil with a bouquet of parsley and 1/2 glass of white wine. Reserve a little of this broth. Saute the foie with butter and white wine, and fill the mussels once opened. 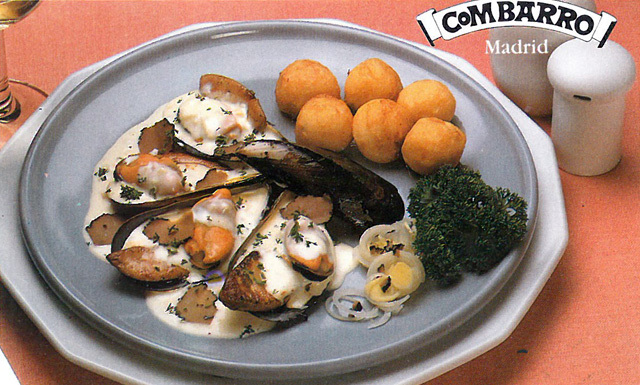 With the cream of truffles the mussels are sprinkled, cook everything and it is served with parsley above. And garnish, potato croquettes. Put in a pot a little of butter, leek and finely chopped shallots. Let it brown, flambé with 1/2 glass of wine and add the liquid cream, let it reduce for five minutes over a low heat. Add the truffles cut into slices, the truffle soup and the soup left over from the mussels. It is thickened with a little cornstarch, if necessary. It is poured over the mussels and served hot.